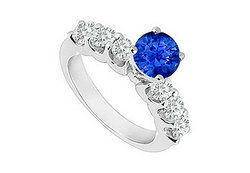 A bigger round blue sapphire is prong-set atop in the center and is flanked by three smaller round diamonds on both side. This beautiful color engagement ring is made in 14K white gold & has a total gem weight (TGW) of 0.80 carat. It also available matching complete sets of engagement ring with wedding band model no. JS127ABW14DS and single wedding band model no. W127BW14D.